When it comes to finding a high-quality modern vehicle that’s right for any environment – from the heat of a dense city to the free open winds of the wide highway – there’s simply nothing that can compare to the 2016 Chevy Trax. Road ready and capable of taking on even the tightest city parking spots, the Trax offers an unparalleled compact experience for discerning drivers who are sick of compromising on size. Bold and big on the inside, this sporty compact offers everything today’s driver could hope for in a smart, city-ready vehicle – and it all comes at a price that’s fit for anyone. Uniquely designed to both save space and provide plenty of cargo room, the 2016 Trax is the perfect vehicle for any urbanite looking to turn up the volume and get into some serious fun. This newest addition to the Trax family sports top-tier handling to match its modern technology, all of which comes together to make one excellent urban cruiser ready to help you unleash your inner style. It’s not easy to seamlessly combine the handy utility of a cargo-rich interior and the convenient size of a capable compact, but Chevy has come through in spades with the new 2016 Trax. Utilizing a unique design, the Trax is able to both maximize comfort and interior room while still keeping the finely crafted form of a small compact SUV. You’ll be able to take on those tight parking spaces with the utmost ease thanks to the Trax, spanning just 167 inches in length and a 100-inch wheelbase for easy in-and-out of any small spot. A tight turning radius and 16-inch standard aluminum wheels allow for easy grip on the road around corners, while a low and light body helps you stay grounded even when weaving in and out of congested traffic. Just because the Trax looks compact on the outside doesn’t mean it’s lacking in space on the inside. This adventure-ready SUV comes with a full 48.4 cubic feet of available cargo room thanks to 60/40 rear folding seats and a unique design that can hold even your largest loads of luggage. You can choose just how much space you’ll need based on how many passengers you have to bring along, and with a standard folding front passenger seat you can ride solo with all the space you could ever need for those long cargo-hauling rides. Of course, no SUV is complete without the proper sport-ready performance – it’s what puts the “Sport” in “Sport Utility Vehicle.” Chevy knows this well, and that’s why the 2016 Trax features a powerful turbo engine to match its sporty, road-ready handling that can take on even the most extensive highway drives. Sit down and strap in, because this powerful little compact packs a serious punch under the hood. The 2016 Trax offers unheard of compact performance thanks to the 1.4-liter turbocharged EcoTec engine, which boasts up to 138 horsepower and an impressive 148 lb-ft of torque for enough power to tackle even the toughest inclines. And with a highly-efficient fuel economy topping out at 34 miles per gallon highway and 26 miles per gallon city, you’ll have more fun out enjoying your Trax and less time worried about your next stop-off at the gas pump. Drivers looking for the ultimate in compact handling need look no further than the available All-Wheel Drive on the 2016 Trax, which provides extra traction in those less-than-perfect driving conditions and can automatically shift into FWD to maximize efficiency when all that power just isn’t needed. Plus, with features like sensitive power electric steering and 4-wheel antilock disc brakes, you can drive with the confidence that your sporty SUV won’t let you down when the ride gets a little rough. Of course, no modern ride is complete without all the best of what the tech industry has to offer – and the Trax is no exception. This impressive ride comes packed to the gills with everything, including top-notch entertainment tech, connectivity features that let you stay in business even when you’re on the road, and top-of-the-line safety tech to help stop crashes before they happen, and keep you protected if they do. With so much impressive technology throughout the 2016 Trax, you may just wonder how you ever got by without it before. Like to blast your favorite tunes out on the road? Get ready to experience total high-fidelity sound thanks to the available Bose premium sound system. This integrated audio experience features seven speakers located throughout the vehicle, including a sub-woofer and amplifier to really crank that bass for those nights of sleek urban cruising. Plus, with everything from SiruisXM Satellite Radio to all the USB, Bluetooth, and Aux hookups you could need, it’s a cinch to play your favorite music on demand in this unique and modern ride. Hate having to leave work behind just because you’re in the car? Thanks to the 2016 Trax, you no longer have to be disconnected when you’re driving. Simply connect your smartphone via Bluetooth and use hands-free voice commands to make your selections through the 7-inch Chevrolet MyLink touchscreen. Plus, with features like available 4G LTE throughout and a built-in WiFi hotspot, you can turn your Trax into a mobile workstation with the simple touch of a button – meaning you’ll never have to stop the presses just because you’re on the road again. As impressive as top-quality performance and high-class entertainment may be, they mean nothing if you and your passengers aren’t safe in your vehicle. That’s why Chevy loaded the 2016 Trax with some of today’s most innovative safety features, many of which work to prevent accidents before they ever happen. A standard Rear Vision Camera with available Rear Park Assist solves the problem of those pesky blind spots when pulling into or out of a parking space, while advanced stability control helps you stay in control even when the road conditions turn south fast. And with 10 standard airbags, advanced seat belts, and a reliable anchor system for securing child safety seats, you can ride with peace of mind even when you’re carrying your most precious cargo of all: your family. And if the worst were to occur, standard OnStar service for 5 years ensures you’ll have assistance as quickly as possible in the event that something does happen, meaning you can be confident that your Trax is there to protect you no matter what may happen on the road. 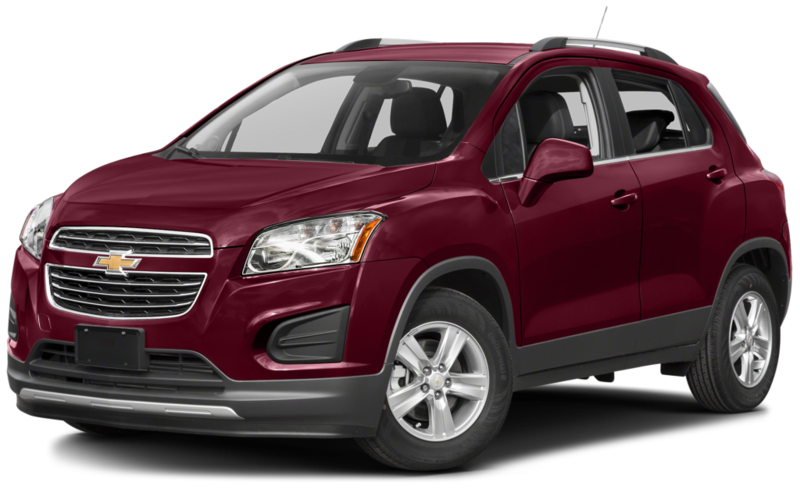 Here at McCluskey, we know the value of an excellent Chevy – and when it comes to great new models like the 2016 Trax, we’re more than happy to make sure you get the vehicle that best suits you. Get in touch with our expert sales professionals and we can guide you right to the vehicle you’ve been searching for – and you may just be surprised at how simple the process can be. If you’re in the market for a vehicle that provides everything you need and matches your fun, friendly lifestyle, consider the 2016 Chevy Trax – and prepare to enjoy the ride.